I want to use this small coffee break (Koffiepause is spelled in Dutch, in German it would be Kaffepause) to reply to your letter. Many thanks for visiting my mother. Things are very hard for her now, she feels lonely (alone), and I am afraid not needed in this world anymore. I am always thinking of her but I am not allowed to write to her, so I am happy for any kindness shown to her. With surprise I read that you (all of you) will now also join in this migration. Do you have specific plans, or is it just a possible project? It must mean a big decision for your parents. I was very happy about Anni’s recovery. Hopefully it will continue and not come back in the new climate. Surely she has been longing for Berlin very much, since it has been a long time that she was separated from you. What will she do now? Will she continue school, start a job, or wait til all of you have gotten out? 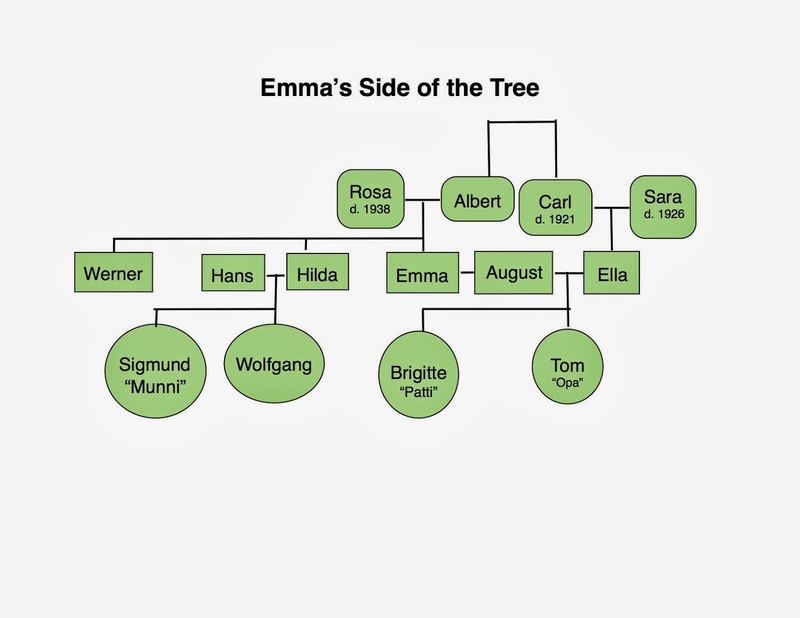 What I have been up to here, you should have from my last letter to the group (the Berlin Quaker group that Tom, Gis, and Anni were members of). I cannot complain about boredom, I am learning shorthand, typing and help out in the office, if one can call my ‘Gestuempe’ (slang for amateur, bungler) any help. But I learn a lot doing it, especially languages. Before, I was so conceited to think I spoke French quite well, now I see that I am just able to make myself understood. I am not even able to translate a simple message into French. Our school French is so miserable, we learn expressions not needed at all, and have a habit, because of the exaggerated grammar use, to express ourselves in a (stiff, uptight, screwed in tightly) way. I am desperately waiting for my permit, to finally start my studies. But it seems to come true soon, because I can tell they are working on my application. The other day I was called to the police station to report about my experiences. The inspector was to gain an impression of me, and then report to the ministry. He was very nice, laughed about my travels and advised me to write a “Wild West” novel. I certainly had the material for that. He then gave a very favorable report about me and promised to do whatever was in his power. So I hope for the permit soon. When you write to me, please use only the shown address, and also consider it in the heading of the letter. I titled this blog Koffiepause for multiple reasons: 1) It’s a fabulous word, 2) It’s fun to say, 3) Opa writes during his koffiepause- and so do I. 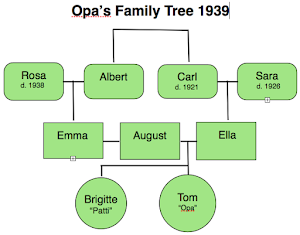 In the last few months, we have found two sources of new documents that give more information about that “transition” year when Opa lived in Holland before he emigrated to the USA. 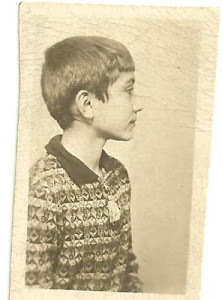 The first set of documents are from Opa’s friend, Gisela, who was in the Quaker youth group with him. 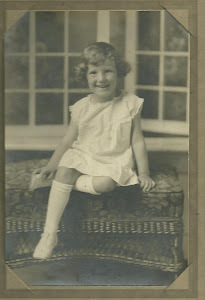 Opa corresponded with her and her sister, Anni, and Gisela kept Opa’s letters for over 70 years (wow!). When I met with Gisela in Berlin, she was so generous in giving us copies of these letters. 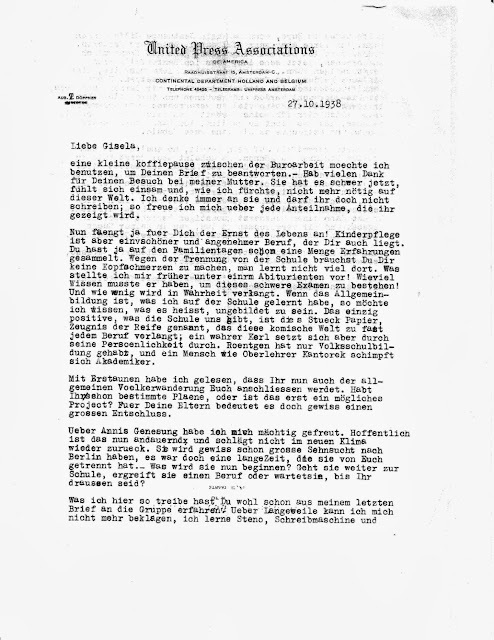 These letters are so fantastic because they are written by Opa to Gisela and Anni, in a time period where we had no details of his personal life and thoughts. Now we have insight! 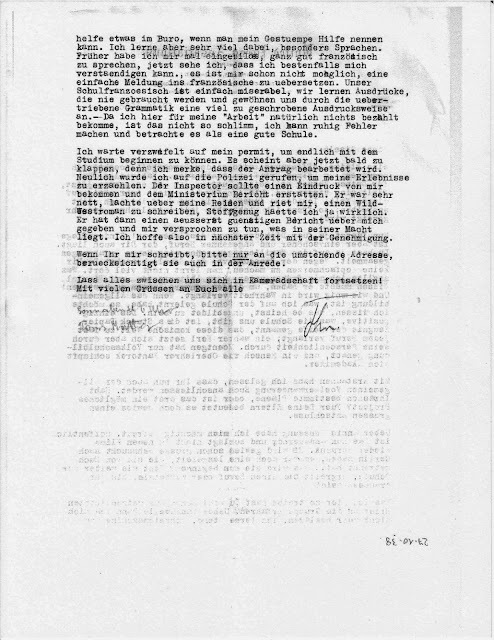 The second source of information has been the American Friends Service Committee (AFSC) files that we were able to copy from the archives of the Holocaust Museum in D.C.. If you've followed along from the beginning, you've seen one of these letters already. 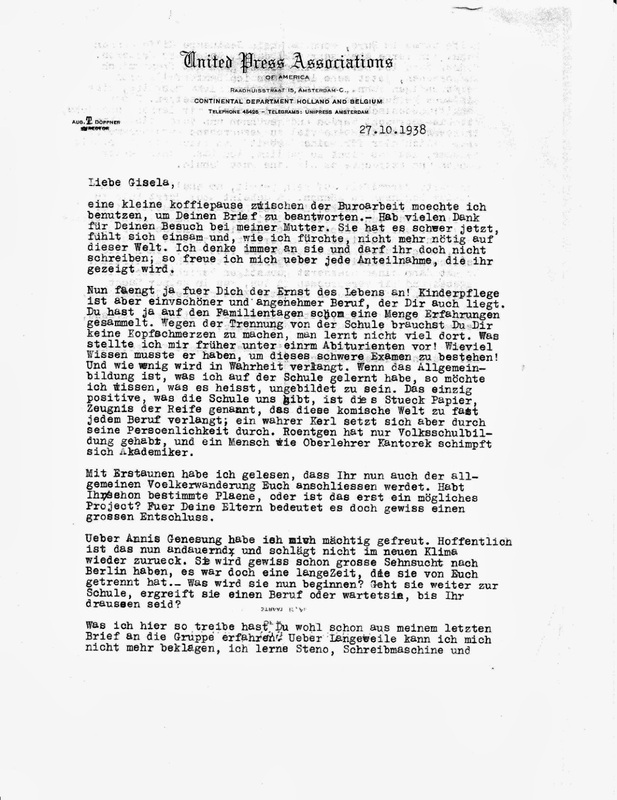 This current letter is the first from Opa to Gisela. 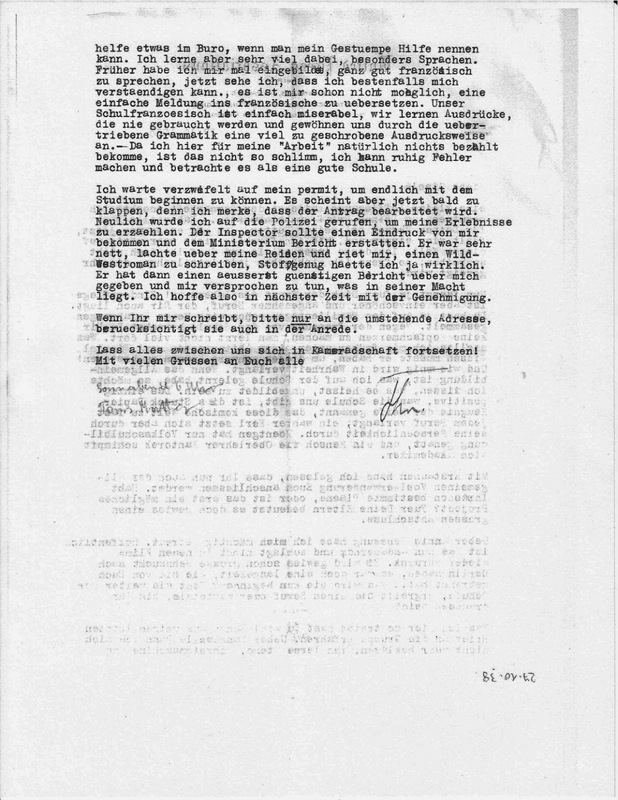 Opa illegally crossed the border into Holland sometime in late September of 1938. It sounds like he has already written to the Quaker youth group detailing his experiences. This is a personal letter in reply to something Gisela has written. I love that Gisela visited Opa’s mother, Ella. Opa seems to have insight into his mother’s emotional state, as she is an empty-nester by tragedy rather than opportunity. Opa mentions that he cannot write her. I’m making a fairly confident guess that Opa is unable to write to his mother because the Nazis might be checking her mail for sign of the boy who dodged the draft and illegally left the country. He is writing from his father’s workplace, a newspaper office, to a Quaker in Berlin, this is much less conspicuous. I do wonder though, just how broad were the Nazi censors at this point? Did he put himself in danger by writing to Gisela? Or would the Nazis have even bothered going after an 18 year old in Holland? I really don’t know. From Opa’s letter, it sounds like Gisela’s family is considering the possibility of leaving the country. This is a surprise, perhaps because the family is still relatively safe. It would have required a great deal of foresight for the Halle family to even consider leaving. It seems the future is a bit in the air for many people in Opa’s group, including Anni, Gis, and their family. When I was in college, Opa mentioned learning shorthand and said it was the most useless skill he learned. This is kind of hilarious to me now that I know what actually happened. The description of the letters are SO different from how I imagined it when he told us this story of his time waiting to go to the US. In my mind, the way he told us, I imagined him in an isolated house (think cabin in the woods) holed away in a room upstairs, reading a book on shorthand for 6 weeks and twiddling his thumbs in boredom (because why else would you study shorthand?). But in reality, he was staying with his father and stepmother in a townhouse in Amsterdam and was his Dad’s shadow at work where he did odd jobs, to include trying to learn skills like shorthand. He does all this to bide his time while he waits for a permit to stay legally in Amsterdam and leave legally for America. Opa seemed to have a pretty good time in Amsterdam, even the police officer at the station took an interest in Opa’s story and gave him hope for his next steps. I wonder if the folks still in Berlin envied his “adventure” and seemingly good fortune. Gisela, as I would expect her to, wrote herself a note on the letter: “Saturday, 6 o’clock Tom’s mother.” I’m guessing this is her next date to visit Ella. I really appreciate that. I know Opa did too.